Throughout the 19th century, chemical works on turpentine led to term 'Terpene' the hydrocarbons having the general formula C10H16 found in the complex plant product. These Terpenes are often found in plant necessary oils that have the 'Quinta essentia', the plant fragrance. They are globally present in small amounts in living organisms, where they play many important roles in plant physiology and also significant functions in all cellular membranes. On the other hand, they are as well accumulated in numerous cases, and it is illustrated that the extraordinary variety they then display can be because of the ecological factors playing an evolutionary role. The term 'Terpene' is derived from the term 'turpentine'. Terpenes might be stated as a group of molecules whose structure is mainly based on different however definite number of isoprene units (that is, methylbuta-1, 3-diene, termed hemiterpene, having 5 carbon atoms). Whenever Terpenes are chemically modified, like by oxidation or rearrangement of the carbon skeleton, the resultant compounds are usually termed to as the terpenoids. Terpenoids (or Isoprenoids), a subclass of the prenyllipids (that is, Terpenes, prenylquinones, and sterols), symbolize the oldest group of small molecular products synthesized via plants and are almost certainly the most extensive group of natural products. Terpenoids can be illustrated as modified Terpenes, where methyl groups are moved or eliminated, or oxygen atoms added. On the contrast, some use the word 'Terpenes' more generally, to comprise the terpenoids. Terpenes history spans different civilizations. As they are mainly found in essential oils, they were employed in the Ancient Egypt for different religious aims. Camphor was introduced in Europe from the East via the Arabs around the 11th century. The method of getting plant essential oils via fatty extraction was identified by the early Middle Ages. In the 12th century, Arnaud de Villanosa illustrated distillation of oils from rosemary and sage. He formed an 'oleum mirabile' from the oils of turpentine and rosemary. This is noticeable that some of the 60 oils were illustrated in the Nuremberg edition of 'Dispensatorium valerii cordi' written in the year 1592. The analyses of oils of turpentine were made up in the year 1818 by JJ Houston de la Billardiere. Dumas stated in the year 1866 the term 'Terpenes' derived from turpentine, rather than camphor for crystalline oxygenated substances extracted from the essential oils. In the year 1887, Wallach O stated that one isoprenic unit of 5 carbon atoms (C5H8) is for all time present in the molecule of Terpenes. The structure of camphor was discovered by Bredt in the year 1893, that of pinene via Wagner in year 1894 and that of citral by Tiemann in the year 1895. β-Carotene was isolated in the year 1837 via Wackenrodder from carrots, and its correct molecular form was determined in 1907 by Willstatter. The period since 1945 has seen an extensive explosion in natural product chemistry because of the advent of chromatographic and spectroscopic methods. The discovery of the isoprene unit is the base of the perception of the 'isoprenic rule' edicted in the year 1953 by Ruzicka and done by Lynen. Mevalonic acid was illustrated in the year 1956 to be a biosynthetic precursor of cholesterol and subsequently, its incorporation to a number of terpenoids has been explained. In reality, an increasing number of terpenoids are explained in the plant kingdom and most of them were shown to have significant biological activities. Therefore, some sesquiterpenes and diterpenes encompass antibiotic properties, a few sesquiterpenes and diterpenes are insect and plant hormones, correspondingly. Terpenoids are extremely diverse however they all originate via the condensation of the universal phosphorylated derivative of hemiterpene, isopentenyl diphosphate (IPP) and dimethylallyl diphosphate (DMAPP) providing geranyl pyrophosphate (GPP). In the higher plants, IPP is derived from the classic mevalonic acid pathway in the Cytosol however from the methylerythritol phosphate pathway in the plastids. This is usually accepted that the cytosolic pool of IPP serves as the precursor of sesquiterpenes, triterpenes, sterols and polyterpenes while the plastid pool of IPP gives the precursors of mono-, di- and tetraterpenes. Most of the organisms manufacture terpenoids via the HMG-CoA reductase pathway, the pathway which as well generates cholesterol. The reactions occur in the Cytosol. The pathway was introduced in the year 1950. The 2-C-methyl-D-erythritol4-phosphate/1-deoxy-D-xylulose5-phosphate pathway (that is, MEP/DOXP pathway), as well termed as non-mevalonate pathway or mevalonic acid-independent pathway, occurs in the plastids of plants and apicomplexan protozoa, and also in numerous bacteria. It was introduced in the late year 1980. Pyruvate and glyceraldehyde 3-phosphate are transformed by DOXP synthase (Dxs) to 1-deoxy-D-xylulose 5-phosphate and by DOXP reductase (Dxr, IspC) to 2-C-methyl-D-erythritol 4-phosphate (MEP). The later three reaction steps catalyzed via 4-diphosphocytidyl-2-C-methyl-D-erythritol synthase (that is, YgbP, IspD), 4-diphosphocytidyl-2-C-methyl-D-erythritol kinase (that is, YchB, IspE), and 2-C-methyl-D-erythritol 2,4-cyclodiphosphate synthase (that is, YgbB, IspF) mediate the formation of 2-C-methyl-D-erythritol 2,4-cyclopyrophosphate (MEcPP). Lastly, MEcPP is transformed to (E)-4-hydroxy-3-methyl-but-2-enyl pyrophosphate (HMB-PP) via HMB-PP synthase (GcpE, IspG), and HMB-PP is transformed to isopentenyl pyrophosphate (IPP) and dimethylallyl pyrophosphate (DMAPP) via HMB-PP reductase (LytB, IspH). 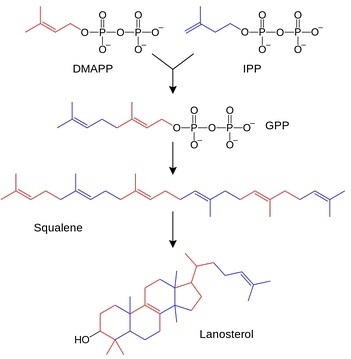 IPP and DMAPP are the end-products in either pathway and is the predecessor of isoprene, monoterpenoids (10-carbon), diterpenoids (20-carbon), carotenoids (40-carbon), chlorophylls, and plastoquinone-9 (45-carbon). 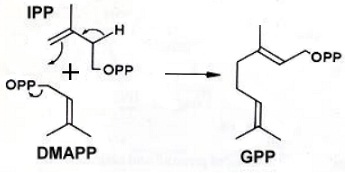 The synthesis of all higher terpenoids proceeds through formation of geranyl pyrophosphate (GPP), farnesyl pyrophosphate (FPP) and geranylgeranyl pyrophosphate (GGPP). However both the pathways, MVA and MEP, are equally exclusive in most of the organisms, interactions between them have been reported in the plants and some bacteria species. Mono-, sesqui-, di- and Sesterpenes include the isoprene units associated in a head to tail fashion. The triterpenes and carotenoids (that is, tetraterpenes) have two C15 and C20 units correspondingly joined head to head. Most of the Terpenes are hydrocarbons; however oxygen-having compounds like alcohols, aldehydes or ketones are as well found. Such derivatives are often termed terpenoids. Mono- and sesquiterpenes are the main constituents of the essential oils whereas the other Terpenes are the constituents of resins, balsams, waxes and rubber. The terpenoids, at times termed as Isoprenoids, are a big and diverse class of naturally-occurring organic chemicals identical to Terpenes, derived from the five-carbon isoprene units assembled and altered in thousands of ways. Most of them are multicyclic structures which differ from one other not just in functional groups however as well in their fundamental carbon skeletons. Such lipids can be found in all the classes of living things, and are the biggest group of natural products. Oleoresin is a roughly equivalent mixture of turpentine (that is, 85% C10-monoterpenes and 15% C15- sesquiterpenes) and rosin (C20-diterpene) which acts in most of the conifer species to seal wounds and is toxic to both invading insects and their pathogenic. The number of inducible terpenoid defensive compounds (that is, phytoalexin) from angiosperm species is well. Such comprise both sesquiterpenoid and diterpenoid kinds. Isoprenoid units are as well found in the frame-work of other natural molecules. Therefore, indole alkaloids, some quinones (such as, vitamin K), alcohols (such as, vitamin E, vitamin A made up from β-carotene), phenols, isoprenoid alcohols (as well termed as terpenols or polyprenols) as well have terpenoid fragments. The origin of the ubiquitous isoprene unit and its transformation to different compounds has been widely studied. Terpenes are a huge and varied class of organic compounds, generated mainly by a broad variety of plants, specifically conifers, although as well via some insects like termites or swallowtail butterflies that emit Terpenes from their osmeterium. They are the main components of resin, and of turpentine generated from resin. Moreover to their roles as end-products in most of the organisms, Terpenes are the main biosynthetic building blocks in almost each and every living creature. Terpenes and terpenoids are the main constituents of the essential oils of numerous kinds of flowers and plants. Essential oils are broadly employed as natural flavor additives for food, as fragrances in the perfumery, and in traditional and alternative medicines like aromatherapy. Synthetic variations and derivatives of the natural Terpenes and terpenoids as well greatly expand the diversity of aromas employed in perfumery and flavors utilized in food additives. Vitamin A is an illustration of a Terpene. The aroma and flavor of hops, extremely desirable in several beers, comes from Terpenes. Of the Terpenes in hops myrcene, b-pinene, b-caryophyllene and a-humulene are found in the biggest quantities. Plant terpenoids are extensively employed for their aromatic qualities. They play a responsibility in traditional herbal remedies and are under investigation for antibacterial, antineoplastic and other pharmaceutical functions. Terpenoids add to the scent of eucalyptus, the flavors of cloves, cinnamon, and ginger and the color of yellow flowers. Famous terpenoids comprise citral, menthol, camphor, Salvinorin A in the plant Salvia divinorum and the cannabinoids found in the Cannabis.